I'm kind of over the Colourpop craze and these were the last products that I wanted to try. I love their Matte X lippie stix formula, while the rest I've tried excluding these eyeshadows and highlighter is more average in terms of quality, but I like their products nonetheless, especially due to affordable prices. In all honestly shipping and customs fees make me not want to explore this brand as much as I might want to or at least as much as wanted to in the past. If they were smart enough they'd set up a warehouse in Europe long ago or at least allow their products being sold in one of the Europe based online shops, but since they are still only based in the US, I've only done a couple of orders so far. 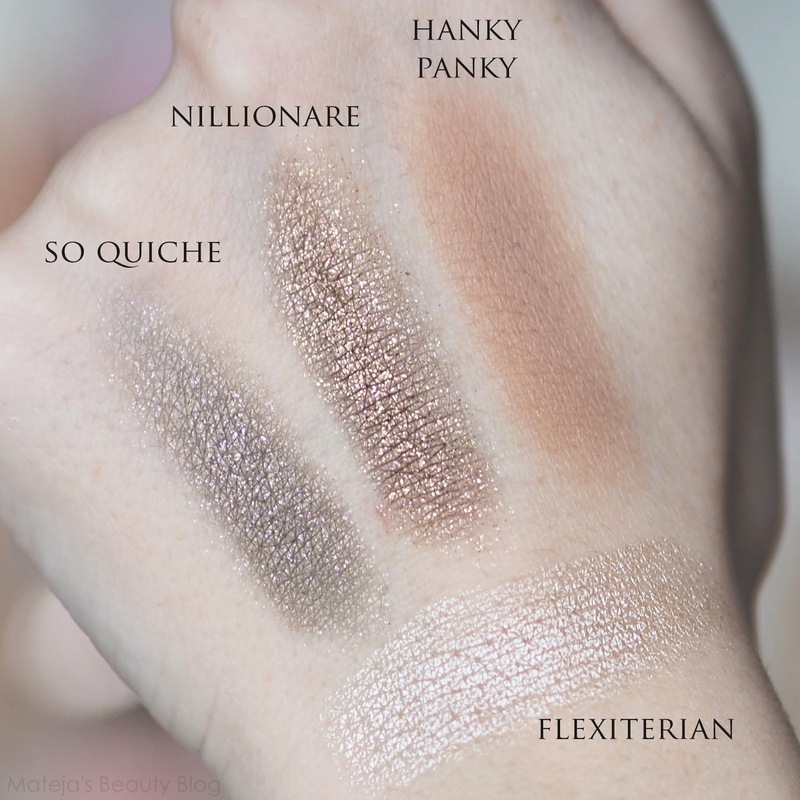 Formula: These eyeshadows are seriously hyped-up in the beauty community, unfortunately they did not turn out as pigmented as I hoped, but one thing that I noticed about these is that it took about a week to get to the really pigmented layer. I don't know why such creamy formula would be so inconsistent, but these did not impress me with the first few uses. Pigmentation differs from shade to shade, but formulas are all very soft and creamy, similar to play-doh, so they get a dent when you swatch them with fingers and it's almost impossible to pick them up with a brush. The matte shade is less creamy than the ultra glitters, regardless I'm still having trouble picking it up with a brush. I apply these with fingers and blend the edges with a fluffy brush. This is one of my most unique shades. It's a taupe mixed with green-gold and as a complete juxtaposition it has violet shimmer which I'm still deciding if it really works here (gold would be better). The shimmer is difficult to pick up with a camera, but it's very obvious on the eyes and it's quite large shimmer particles. Pigmentation is medium and it needs to be build up, which is the main source of my disappointment, but I can get a fully opaque look with a few heavy layers. It's the shade I wear often because I love such colours, however, I'd prefer if it didn't have glitter. This was disappointing from the start because it swatched sheer on my eyes with large shimmer particles, but on day 7 after stating using this, it became the most pigmented out of the three. It's a classic bronze shade with large shimmer particles (larger than in So Quiche), so this is more of a shade for special occasions than an every day colour. Hanky Panky is a matte warm light-medium brown. I expected this to look a cool brown that I could use in the crease, unfortunately it's too peachy brown for my colouring. The formula is very smooth, but with the weakest pigmentation out of the three. I don't use this one at all because it's too warm. I tried to find a cool taupe shade in Colourpops range, however, a majority of their neutral colours are warm which is not to my taste. Staying power of these is great even without a base. 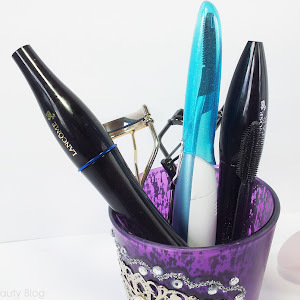 Formula is overall very similar to Essence's Melted Chrome, yet these outlast them by a mile. When I swatched these on the hand, I could not wipe off all the colour which is impressive. On the eyes they stay vibrant for hours and don't fade quickly. On my non-oily eyelids they don't crease so 8h later they would still look very decent if the weren't for the ton of glitter than collects under my eyes. The packaging is bulky for the amount stored inside and I'm not loving the screw off lids. Due to a very creamy formula you hit the pan very fast. I was using Nillionare for about two weeks when I hit bottom which hasn't happened to me with any eyeshadow so far, but I use so Quiche a lot more and I haven't hit the pan, so I don't know what that's about. These cost $5 on Colourpop's website. Formula and shade: I did not get along with this at all from the start because of its unique texture that is like at eyeshadows something between a cream and a powder. I can't pick this up with brush, so I have to apply it with fingers and because my skin is currently dry, I could not get this too apply smoothly and it just looked a mess and half of it ended up all over the cheeks through the day. But as soon as I switched my foundation for a more moisturising one, I got a successful application and what a pretty highlight this is. It's one of the most reflective highlighters with the finest shimmer I've seen and a lovely champagne warm glow. I've been wearing every day for months and it's only because I'm currently testing something new that I made a switch, but I'm going back to it soon. Staying power depends mostly on the base. At times it lasts nicely all day and then some other times I'm left with shimmer down my cheeks. Powder tends to stick on the skin better than more creamy formulas, but this looks a lot more natural than a powder so I forgive it on those odd days. But one thing this makes me angry - the stupid packaging. The product fell out twice, the second time it came apart in so many pieces that I had to press it all back in and now it looks terrible. But it didn't ruin the product and it could be fixed much faster than if it were a powder. The screw off lid bothers me even more here because I use it every day. Colourpop can be bought on their official website. Shipping is about 10 € to Slovenia and once in a blue moon they have special offers with free shipping, but unless you're adamant you want to pay a 22.5% tax plus the useless 5 € extra charge, I suggest you keep your purchases under 22 € (information for Slovenia of course) and if you're getting anything at all, get the Flexiterian, you won't regret it. Oh, and Cami Lippie Stix too. I'm not really feeling Nillionare. Too much chunky shimmer and I expected a more metallic finish. Great Post! I love their Eyeshadows, but I definitely need to try that Highlighter! I heard a lot about Flexiterian! Sama nimam ničesar od Colourpopa, ravno iz teh razlogov, ki si jih naštela. Ampak tale So Quiche mi je pa tako čudovita senčka, sploh zaradi kontrasta in vijoličnega shimmra. Zelo lepo izpade na tebi. Nič podobnega še nisem videla in vedno padam na te ekstra barve. Jo bom kar od daleč občudovala, ker samo zaradi tega se mi tudi ne da naročat, druge njihove stvari me ne mikajo, je že veliko podobnih stvari lažje dostopnih. So Quiche je res zelo poseben odtenek in ga pogosto nosim - kar samega ker se mi ne da preveč ubadat s senčili. Ampak če ni brezplačne poštnine se tudi meni ne da naročat. Flexitarian je pravi biser. Res en najboljših osvetljevalcev, sploh za svetlo kožo.<3 Mene tekstura ne moti. Ga nosim tudi čez pudraste izdelke in se dobro nanaša. Jaz prisegam bolj na glitter in shimmer odtenek super shock senčil. Meni so res všeč predvsem bleščičasti, ki jih zelo hitro lahko nanesem čez kakšno koli senčilo za več drame in zanimivosti. Mi je pa ta Hanky Panky padel v oči že dolgo nazaj. Odtenek mi je všeč, čeprav nimam nobenega odtenka mat v tej formuli in ne vem kako bi ga sploh nanašala :D. Mi je pa ime tako hecno in me očitno zato privlači :D.